I was able to review a variety of gourmet tortillas from Deer Creek Foods! High quality is obviously very important to this Utah based company. You can tell with one taste! I love that they have so many kinds!! And with each one they have a recipe to try it with! 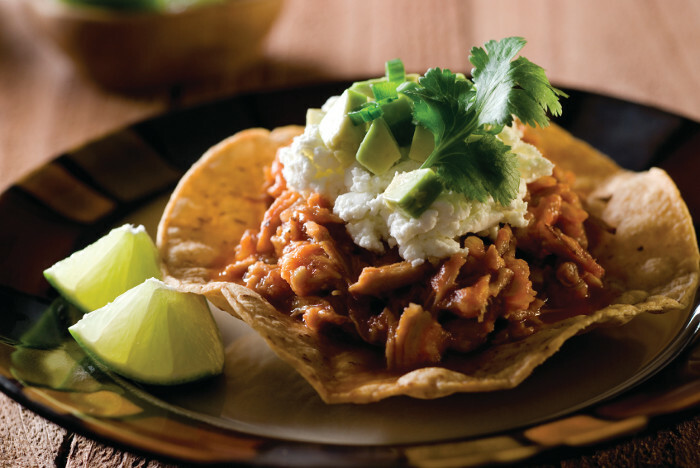 For example you can use the Salsa Verde Tortillas to make Pulled Pork Tostadas! Deer Creek Foods tortillas are as fantastic as they sound!! One recipe I tried was a tuna wrap on a Tomato Basil tortilla! The tortillas add a great flavor to any meal! My kids even liked these wraps!! (without the onion that is) Along with one meal this week the kids just wanted a Garlic Pesto tortilla with butter melted on it...YUM!! I also tried the Garlic Pesto tortillas in my chicken enchiladas recipe I always use. It was so amazing! I love all of the options of flavors and fun new recipes there are to try with them! Each box has a recipe card on the back of it. These really dress up any meal! Be sure to check out Deer Creek Foods on Pinterest to get some ideas of what to do with their products. I'm excited to make Thin Crust Pizza Bites with the Smokey Chipotle ones!! "We only use real ingredients for a delicious, natural taste. 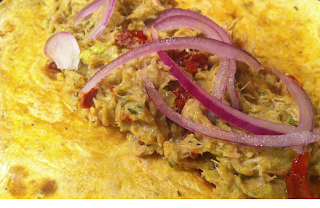 Every tortilla is lovingly made with real wheat ﬂour and is naturally low fat." Keep up on sales, promotions and great recipes by following Deer Creek Foods on Facebook and Twitter. Find a Deek Creek Retailer near you! Chocolate Tortillas, Nutella, Philadelphia Cream Cheese Cake Filling, Whipped Topping, Fresh Berries and Chocolate Sauce!!!! I'd like to try the cornflower! 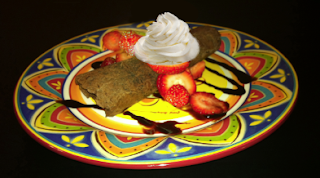 I love to try the dark chocolate tortilla to make the dark chocolate fried ice cream. Ooooh...the Dark Chocolate...I'd make me a taco banana split! I really want to try the dark chocolate one!!!!! I have to say the dark chocolate! Anything chocolate is a winner! I would love to try Fresh Spinach in my meal and the Chocolate for dessert. 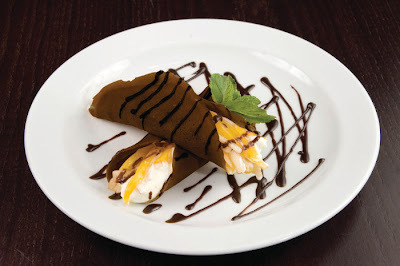 I would like to try the savory chipotle tortillas (and, of course, the CHOCOLATE TORTILLAS)! I would definitely like to try the dark Chocolate. Oh yeah...I really want to try the chocolate! I'd make the dar chocolate fried ice cream for my little chocolate lover!! Love that they are lower calorie than some tortillas and would love to try them all!!!! Wow any of this would be amazing to try! All of my family members are big fans of anything wrapped in a tortilla. I don't think I've ever made dessert in one though. This would be a the perfect dessert for us!! The chocolate ones would be great fun! would love to try them! 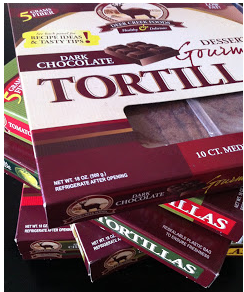 I would like to try the dark chocolate tortillas! The garlic pesto sounds amazing! I'd love to try the SMOKEY CHIPOTLE ones yum yum. Thanks for the giveaway and happy holidays to all. I am a sucker for all things chipotle! They were actually in the grocery store awhile ago with samples and the chocolate tortillas were really good! The smokey chipotle sounds great, I'd love to try the Smokey Chipotle & Beef Enchiladas recipe from their website as well! I would love to try the dark chocolate fried ice cream.. These would be great for other wonderfully delicious desserts. I would love to try the whole wheat flour tortillas! I would like to try the cornflower tortillas. the dark chocolate dessert sounds fantastic! Dark chocolate for dessert recipes! I'd like to try garlic peto! Dark chocolate for dessert recipes!!! Dark chocolate for dessert recipes!! Tomato Basil for my wraps and Dark Chocolate sound great for desert. I'd love to try the garlic pesto flavor! I would like to try the dark chocolate tortilla. I had no idea tortillas came in so many different flavors!! They all sound delicious! But, Im dying to try the chocolate!! !